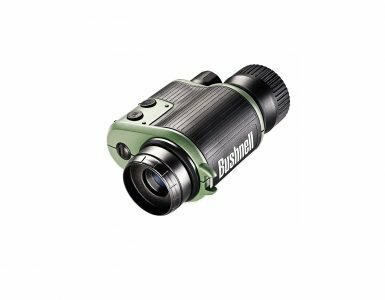 Having tested plenty of Bushnell products in the past I have come to expect great things from this brand, so I was eager to see what they had to offer with the Equinox Digital Night Vision Monocular. The Equinox is actually available in three different models, so you can decide what size lens and level of magnification is required for your needs. The price obviously goes up if you opt for the better models, but no matter which one you choose you are guaranteed a quality product that adheres to the high standards set by Bushnell. The 2X28mm is the entry level model for the range and is not a bad choice for someone that hasn’t had much experience with night vision monoculars and want something to get started with. When it comes to the overall design, the Bushnell Equinox is another piece of equipment that would look just as at home in a high-tech spy thriller as it would in your hunting bag. The housing is made from rugged and water resistant housing, which keeps the weight down and allows for a comfortable grip. The Equinox is quite compact and I had no problems carrying it around for extended periods while testing it outside. The two buttons are located on the side of the housing, just below the Bushnell logo and are easy to locate as well as operate in the dark. While holding the monocular, these buttons are right at your fingertips so you don’t have to waste time fumbling for buttons or switches in the gloom. One minor gripe I have with the design is that the tethered lens cap is quite large and can be tricky to pop off in the dark. You can also put a lot of strain on the front of the camera while doing so, which might cause some damage in the long run. The design was probably to ensure that no moisture seeps into the lens when covered, but it is still something worth keeping in mind and extra care is needed. 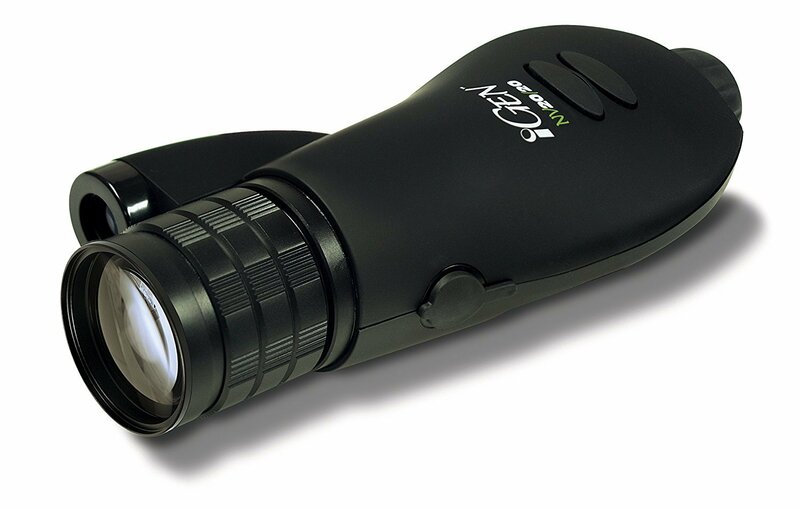 The monocular uses one CR123 lithium battery to operate, but on the plus side the battery life is very good and, depending on how much you use the device, you won’t have to switch out batteries too often. Interestingly enough, the other Equinox Z models with bigger lenses and more features all use AA batteries to operate. As far as extras are concerned, you will find a zippered nylon carrying pouch in your Bushnell Equinox box. I would have liked to see a battery included, but sadly this is not the case. I did like the fact that the Equinox can be mounted on a tripod if you wish. The Bushnell Equinox powers up very quickly although it does take a while to power down again when switched off. The 28mm lens is obviously not as good as the 50mm ones on the market, but it does give the monocular a slight edge over the devices with only 24mm lenses. 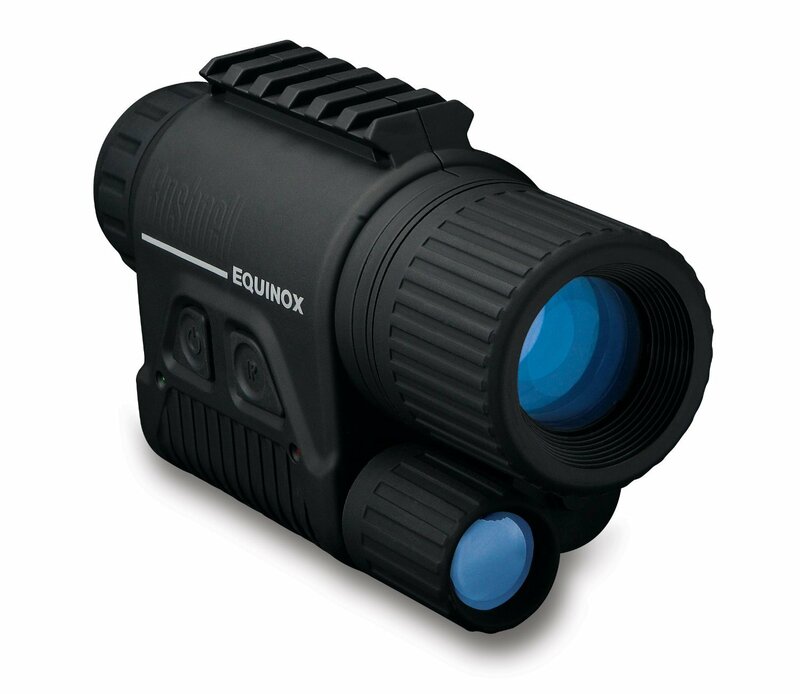 If you are willing to spend a bit more, the Bushnell Equinox is also available in 30mm and 40mm models. This monocular sports 2 X magnification and with enough ambient light, it has a decent viewing range. In total darkness you have to rely on the IR illuminator which gets the job done, but it’s not the best that I have tested. For a Gen 1 device it is more than adequate though, especially when taking the price into consideration and it provides some nice depth perception as well. Bushnell is a trusted brand and I have spoken to quite a few people who praised their customer support which is always good to know when buying expensive equipment. I didn’t encounter any problems with the Equinox that I was testing though and it performed perfectly right out of the box. There aren’t a whole lot of downsides to buying a Bushnell Equinox night vision monocular provided you know what you want from it. When opting for the 2x28mm model, bear in mind that it isn’t going to have the range and magnification of its more expensive counterparts. If you only require a night vision monocular for some basic nighttime surveillance of your yard you can’t go wrong with the Bushnell. For use out in the field there are better options available, but once again the price is going to be a big deciding factor. Serious hunters or trackers are probably going to want something a bit more advanced than the Equinox, but for casual or occasional use this is not a bad night vision monocular to own. The optical quality is great and it is hard not to like the stylish yet durable housing. While the Equinox 2x28mm uses CR123 batteries, this is offset by the fact that the battery life is quite good. I also appreciate the fact that the design incorporates support for a tripod mount although the Equinox is lightweight enough that holding it still for extended periods of time isn’t too hard. While everyone would obviously like to own the best equipment on the market, this isn’t possible due to high prices. Fortunately Bushnell is a brand that takes just as much pride in their cheaper products, so you don’t have to worry that you won’t be getting value for money when working with a tight budget.